It is with deep regret the we must inform you all of the decision to cancel this year’s regatta due to unsafe river conditions. The water had been steadily falling in Bridgnorth, but unfortunately it has not done so enough, nor has the steam slowed to an acceptable level. With the height and flow of the river, coupled with the number of junior and novice entrants into this year’s event we feel it would be unsafe to try and run the event. We apologise for any inconvenience caused to clubs and crews, and a full refund of entry fees will be arranged. Next year sees Bridgnorth Rowing Club celebrate its 150th anniversary, so please put next year’s regatta date, Saturday 9thJune 2018, into your diaries now as we plan to make that regatta an extra special one, and would love to welcome you all along! 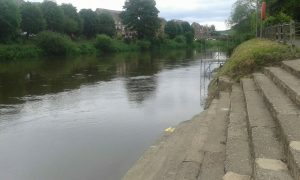 Just to give you an update on the current situation with regard to river levels in Bridgnorth. At the minute the river is slightly up, it has peaked upstream so should be down to normal levels by us in time for Saturday – however this is all dependent on what the rain forecast in the next 24 hours does to the river. We are continuing to monitor the weather and river levels and will make a final decision one way or another whether it will be safe to go ahead at 12 noon on Friday 9th June. A communication will be sent out and posted on our website shortly after the decision has been made to inform you all, so please keep a close eye out for this. Fingers crossed we will see you all on Saturday! Bridgnorth Regatta 2017 this coming weekend! We’d like to thank all the clubs that have supported our regatta this year. We have had much a larger entry compared to last year and look forward to seeing you all on the day. And finally! The information everyone has been waiting for, the provisional draw is available right here at BRC Draw – Final 2017! Our regatta returns on Saturday 10th June 2017. With added entries from Junior 12 through to Masters K.
We are just finalising our entries on BROE and hope to open no later than this weekend. In the meantime, have a look at all the events on offer by download the Bridgnorth Regatta Poster 2017.